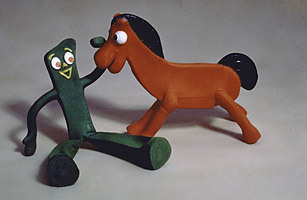 Veteran animator Art Clokey created Gumby, the lovable green creature made of clay, for his 1953 short film Gumbasia. Television executives loved the character so much, they granted him his own program, The Gumby Show. His unusual shape and claymation movements made him a unique character. Clokey later admitted that the unusual shape of Gumby's head was modeled after one of the few surviving photos of his father, which shows him with a large wave of hair protruding from the right side of his head. In 1955, Gumby toys hit the market. The bendy action figure has become a prized classic in the toy world and has been a regular at toy stores since its introduction.